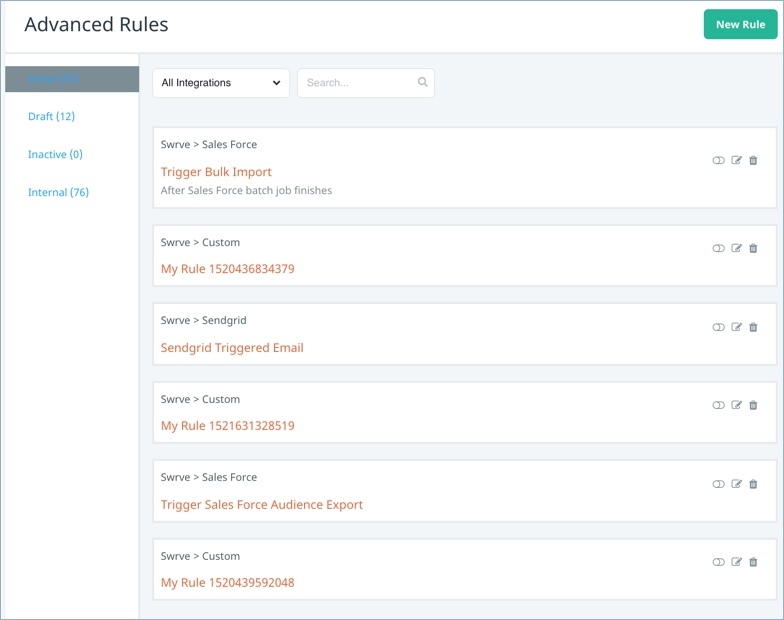 Define the workflow of the data you send and receive between Swrve and your third-party integrations with Advanced Rules. Create highly personalized, relevant interactions with your customers in real-time by defining what actions to take when certain events are triggered, whether within Swrve or when received from your external system. Or use Advanced Rules to specify conditions for the export of data from Swrve to your external systems. Search for or sort the list of rules by integration. Create a new rule by selecting New Rule. Activate or deactivate, edit , or delete an existing rule by selecting the relevant icon on the individual rule summary. Rules consist of any combination of available triggers and actions. Use these combinations to specify multiple conditions that must occur for a rule to be triggered or to select multiple actions. Entering the rule details and selecting the trigger(s). Selecting and scheduling the action(s) to perform when the rule is triggered. Step 1: On the Advanced Rules screen, select New Rule. Step 2: The rule name defaults to My Rule XXXXXXXXXXXXX. To enter a custom name, select the rule name box or edit and enter the rule name. Optionally, enter a Description below. Step 3: To select the trigger for the rule, select Add Trigger. Any activated inbound Adaptors are displayed. If the Adaptor you are looking for is not displayed, check the Adaptors screen to make sure it has been activated. Step 4: Select the Adaptor you want to use to trigger the rule. All events that are available to use with that Adaptor are displayed, plus the option to use Any Event. (Note: Some Adaptors have predefined events that are pre-populated, while others first need to have the event fired before it appears in the list). Step 5: Select the event you want to use. The event menu is displayed. Step 6: By default, the rule is triggered any time the event is received. To select a different event trigger, select another option from the event menu. Depending on the option you select, you can add further filters to the trigger using payloads available for that event. This includes adding AND or OR operators. For a detailed description of the filters and operators available, select the links below. Number of events received The rule is triggered when the selected operator is satisfied. Any numeric value. Summation of The rule is triggered when the total value of the event payload matches the criteria of the selected operator. Select an event payload from the list and then select an operator and enter any numeric value. Average value of The rule is triggered when the average value of the event payload value matches the criteria of the selected operator. Select an event payload from the list and then select an operator and enter any numeric value. Maximum value of The rule is triggered when the maximum value of the event payload matches the criteria of the selected operator. Select an event payload from the list and then select an operator and enter any numeric value. Minimum value of The rule is triggered when the minimum value of the event payload matches the criteria of the selected operator. Select an event payload from the list and then select an operator and enter any numeric value. is less than The result is less than the specified filter. Any numeric value. is greater than The result is greater than the specified filter. Any numeric value. is less than or equal to The result is equal to or less than the specified filter. Any numeric value. is greater than or equal to The result is greater than or equal to the specified filter. Any numeric value. equals The result is equal to the specified filter. Any numeric value. does not equal The result is not equal to the specific filter. Any numeric value. Step 7: To add additional filters, repeat steps 3 to 6 as required. Step 1: To select an action, select Add Action. Any activated outbound Adaptors are displayed. If the Adaptor you are looking for is not displayed, check the Adaptors screen to make sure it has been activated. Step 2: Select the Adaptor you want to use to perform an action. The actions available with that Adaptor are displayed. Each time – the action is performed each time it is triggered, based on the selected conditions. One time – the action is performed once, based on the selected conditions. if the conditions are met – the action is performed each time or once the conditions are met. if the conditions are met within… – the action is performed each time or once the conditions are met, within X minutes, hours, days, months, or years. After you select an action, the fields relevant to that action are displayed. Step 4: Enter the values for the action fields. Any required fields are marked with an asterisk (*). Some fields allow you to enter custom content, for example, an email From or Reply to value. For other fields, you can select a property from the Insert value list to have the field auto-populated. Send Immediately – the action is performed as soon as the rule is triggered. Send after – the action is performed after X minutes, hours or days. Step 6: After you have selected all the desired triggers and actions, select Save Draft if you want to return to the rule to make changes or Save to confirm the configuration of the rule. Some types of actions, for example, Upload CSV or Bulk User Update, send user data in batches. By default, batches send every hour but you can configure batch flush conditions to send the batch when a set of criteria is met. To send batched events based on the number of actions received, select when action count from the list and enter the threshold value. To send batched events based on the size of the batch, select when batch size from the list, and enter the batch size, in bytes. This option sends a new batch when batch size reaches a value greater than or equal to the value you specify. To send batched events based on how long the batch has been idle, select when batch idle from the list and then specify the idle time. Manage your Adaptor integrations. For more information, see Managing Adaptors.